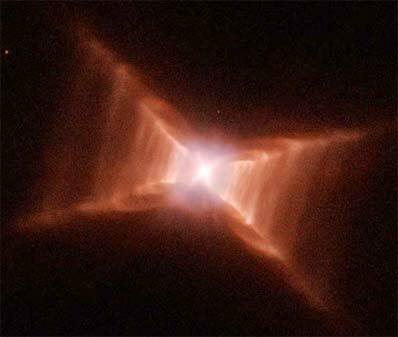 Another remarkable feature of the Red Rectangle, visible only with the superb resolution of the Hubble telescope, is the dark band passing across the central star. This dark band is the shadow of a dense disk of dust that surrounds the star. In fact, the star itself cannot be seen directly, due to the thickness of the dust disk. All we can see is light that streams out perpendicularly to the disk, and then scatters off of dust particles toward our direction. Astronomers found that the star in the center is actually a close pair of stars that orbit each other with a period of about 10 1/2 months. Interactions between these stars have probably caused the ejection of the thick dust disk that obscures our view of the binary. The disk has funneled subsequent outflows in the directions perpendicular to the disk, forming the bizarre bi-conical structure we see as the Red Rectangle. The reasons for the periodic ejections of more gas and dust, which are producing the "rungs" revealed in the Hubble image, remain unknown.